Blackpool’s chances of signing Kevin McNaughton are fading after the defender played for League One rivals Wigan. McNaughton is high on Pool manager Neil McDonald’s wish-list and trained with the Seasiders last week, also playing 45 minutes in Tuesday’s friendly win at Blyth. McDonald was impressed with the former Cardiff City 32-year-old and began contract talks only for Wigan to step in on Thursday. And after McNaughton played 45 minutes in Latics’ 2-0 win against Southport on Saturday, a move to Bloomfield Road looks highly unlikely. Pool head north this morning for their week-long training camp in Scotland with just 18 players and the future of striker Nile Ranger still very much in doubt. The club announced that the AWOL frontman, who has not trained with his club for almost eight months, would return last week but The Gazette understands the 24-year-old again failed to show. Pool have been typically silent on the matter, but if Ranger does not board the team coach today serious questions will be asked about how long McDonald is willing to wait for the controversial forward. The Ranger situation increases the frustrations of McDonald, who hasn’t managed to add to his squad in 10 days since the arrival of Jack Redshaw from Morecambe. Pool’s training camp was timed to begin three weeks into pre-season to enable the new manager to have the bulk of his squad in place. However, with McDonald insisting that “at least five more” are needed, work must still be done to strengthen to a level needed for a League One campaign which is now less than three weeks away. The manager said: “There’s a lot of work to be done and a lot going into the recruitment at the moment. “The eight we’ve got so far is a good return and they’ve gelled quicker than I expected. Pool arrive at their Stirling University base this afternoon. 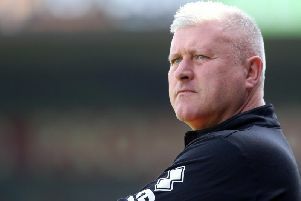 They will face Ross County behind closed doors on Wednesday before taking on St Johnstone, who finished fourth in the Scottish Premiership last season, on Saturday.